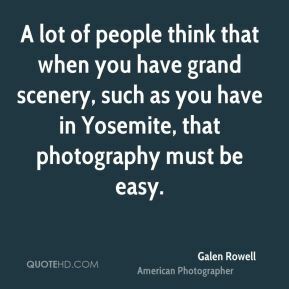 A lot of people think that when you have grand scenery, such as you have in Yosemite, that photography must be easy. 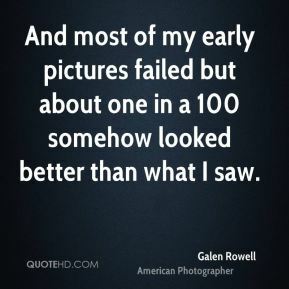 And most of my early pictures failed but about one in a 100 somehow looked better than what I saw. 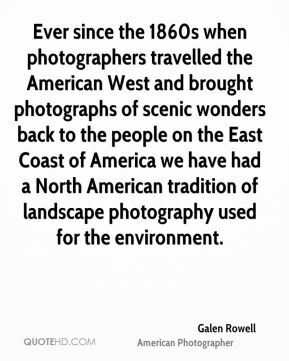 Ever since the 1860s when photographers travelled the American West and brought photographs of scenic wonders back to the people on the East Coast of America we have had a North American tradition of landscape photography used for the environment. 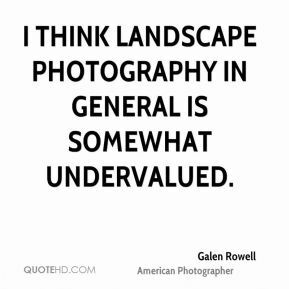 I almost never set out to photograph a landscape, nor do I think of my camera as a means of recording a mountain or an animal unless I absolutely need a 'record shot'. 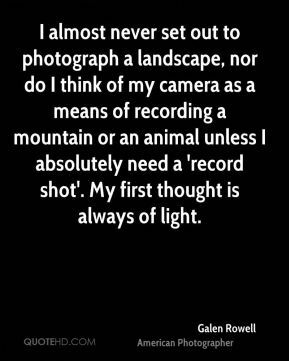 My first thought is always of light. 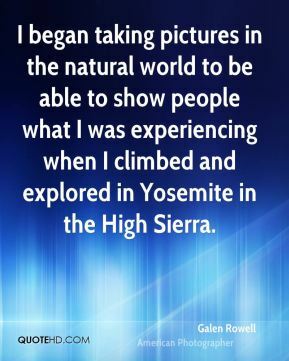 I began taking pictures in the natural world to be able to show people what I was experiencing when I climbed and explored in Yosemite in the High Sierra. 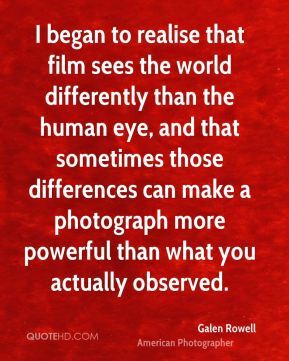 I began to realise that film sees the world differently than the human eye, and that sometimes those differences can make a photograph more powerful than what you actually observed. I find it some of the hardest photography and the most challenging photography I've ever done. 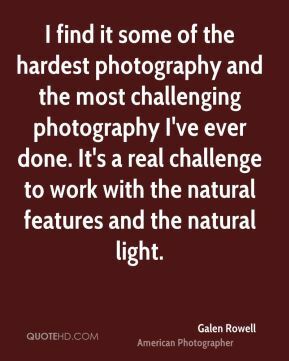 It's a real challenge to work with the natural features and the natural light. 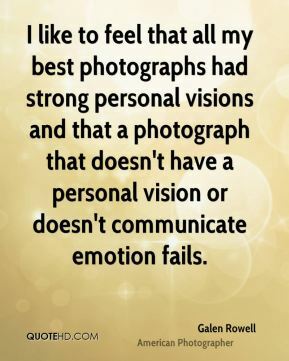 I like to feel that all my best photographs had strong personal visions and that a photograph that doesn't have a personal vision or doesn't communicate emotion fails. 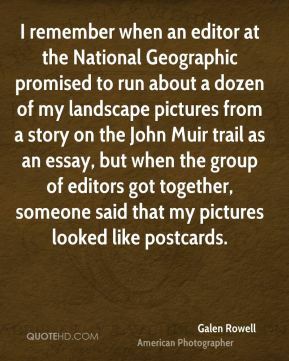 I remember when an editor at the National Geographic promised to run about a dozen of my landscape pictures from a story on the John Muir trail as an essay, but when the group of editors got together, someone said that my pictures looked like postcards. I think landscape photography in general is somewhat undervalued. 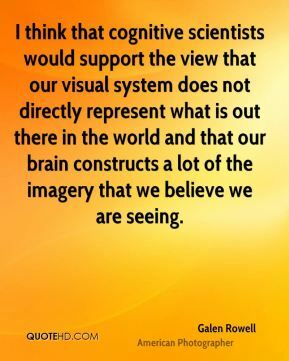 I think that cognitive scientists would support the view that our visual system does not directly represent what is out there in the world and that our brain constructs a lot of the imagery that we believe we are seeing. 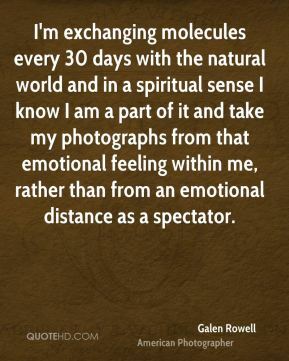 I'm exchanging molecules every 30 days with the natural world and in a spiritual sense I know I am a part of it and take my photographs from that emotional feeling within me, rather than from an emotional distance as a spectator. 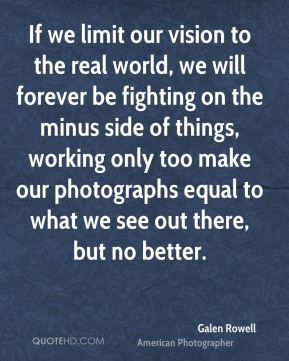 If we limit our vision to the real world, we will forever be fighting on the minus side of things, working only too make our photographs equal to what we see out there, but no better. 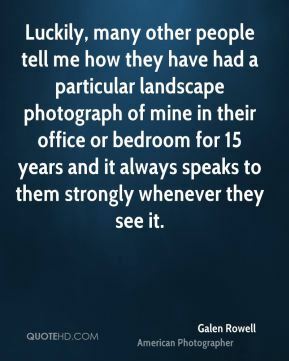 Luckily, many other people tell me how they have had a particular landscape photograph of mine in their office or bedroom for 15 years and it always speaks to them strongly whenever they see it. 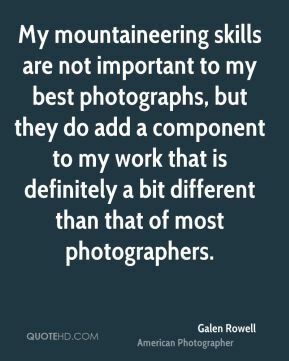 My mountaineering skills are not important to my best photographs, but they do add a component to my work that is definitely a bit different than that of most photographers. 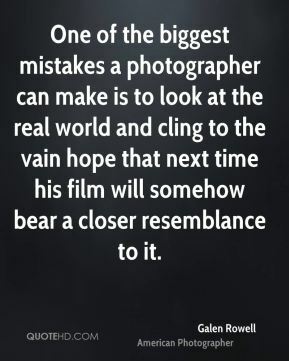 One of the biggest mistakes a photographer can make is to look at the real world and cling to the vain hope that next time his film will somehow bear a closer resemblance to it. 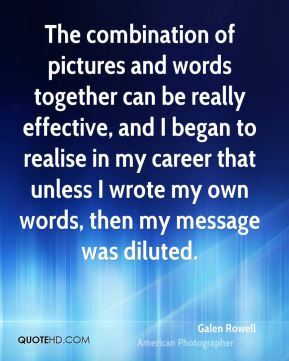 The combination of pictures and words together can be really effective, and I began to realise in my career that unless I wrote my own words, then my message was diluted. 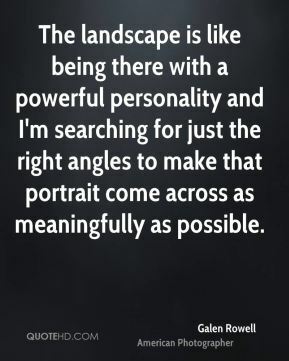 The landscape is like being there with a powerful personality and I'm searching for just the right angles to make that portrait come across as meaningfully as possible. 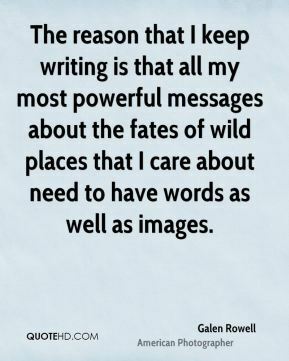 The reason that I keep writing is that all my most powerful messages about the fates of wild places that I care about need to have words as well as images. 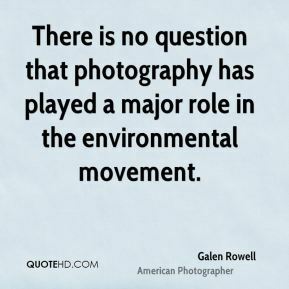 There is no question that photography has played a major role in the environmental movement. 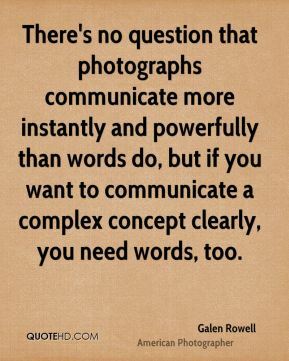 There's no question that photographs communicate more instantly and powerfully than words do, but if you want to communicate a complex concept clearly, you need words, too. 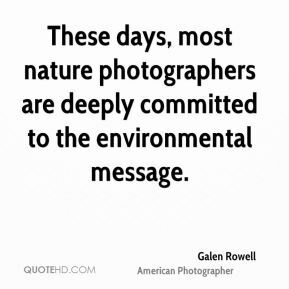 These days, most nature photographers are deeply committed to the environmental message. 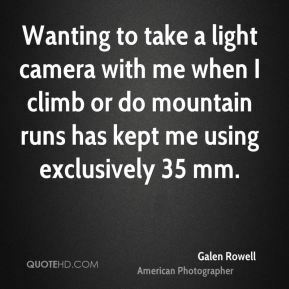 Wanting to take a light camera with me when I climb or do mountain runs has kept me using exclusively 35 mm. 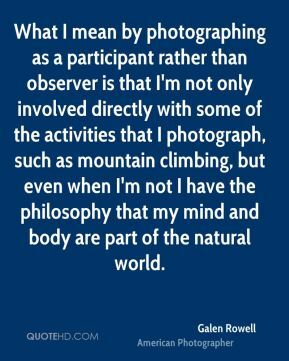 What I mean by photographing as a participant rather than observer is that I'm not only involved directly with some of the activities that I photograph, such as mountain climbing, but even when I'm not I have the philosophy that my mind and body are part of the natural world.